Sean Dyche could smell change in the air ahead of Burnley's opening game of the season against champions Chelsea at Stamford Bridge. That perfume, which carried such a pungency psychologically, gave the Clarets chief the sense that something special could happen against the Blues. And so it proved. A first half double from Sam Vokes and a Stephen Ward strike before the interval was enough to secure a 3-2 win over the hosts, who ended the game with nine men. That victory set the tone for the season, the aroma that emanated from the dressing room in London lingered, and now, heading in to the corresponding fixture, the Clarets can break in to the top six should they complete the double over Antonio Conte's side. “I could smell it in the dressing room," said Dyche. "I thought this feels different, this is a different thing. The players, there was a different feeling, there was a more assured feeling, we’re ready, a focus, a clear-mindedness. “It does not guarantee results, but I felt it was a good feeling going into this game. “As we won that game, that rubber-stamped that feeling and everyone carried that on. “We felt ‘OK, we’re ready to play”. Whereas in previous seasons it had been a nervy feeling of ‘Oh, it’s Chelsea away’ and that can play tricks with players." 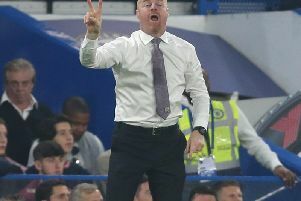 While Dyche accepts that he was anticipating a certain 'je ne sais quoi' the Burnley boss conceded that he was left relatively flummoxed by the scoreline at the interval. "I said ‘I don’t know’. What do you want me to tell them? We’re 3-0 up at Chelsea. We just waffled on and kept our fingers crossed and we managed to get it over the line. "It wasn’t just a great result against a top side, there was a story about one away win the previous season, that was gone immediately. It changes the immediate feeling of the season." From that moment the ambition remained the same as 90 minutes previous; growth in performances and improvement in terms of points and positioning in the Premier League. The situation now, with Burnley seventh on 52 points, and just five games remaining, is way beyond what even Dyche had imagined. He said: "When you get to where we are now, this is beyond what I thought. My marker at first was getting beyond where we were last season which we did a number of games ago. "That's the evidence. Now we just keep on going and going. Now we're breaking new ground and going a good shift beyond where I thought we were. "Everything was taking us to a higher level which is good for the players and good for what we want to continue to build on. Their professionalism in the Premier League has grown considerably."